Dr. Karthik Vallala is a Cardiologist and Cardiothoracic Surgeon in Banjara Hills, Hyderabad and has an experience of 8 years in these fields. 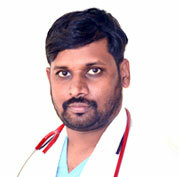 Dr. Karthik Vallala practices at Virinchi Hospitals in Banjara Hills, Hyderabad. He completed MBBS from Mamata Medical College, Khammam in 2010 and DNB – Cardiothoracic Surgery from Yashoda Superspeciality Hospital, Hyderabad in 2017.